Zoho Sites is a powerful but extremely easy to use, cloud based website content management system that allows you create and maintain great looking personal or small business websites with absolutely no need for hardware, software or coding knowledge and, at the same time, hones your online presence and online marketing strategies. There are two editions availbale; the Pro at just US$39 per year and the Free version. Highly reliable website hosting is included, and, importantly, hosting is free for both versions and it does not matter where you registered your domain name. Using drag and drop you can develop a superb website including all the content and mutimedia without knowing any HTML code. Just by dragging the features that you want in "block" fashion you can, for example, compare how text content looks side by side, one above the other, or beside an image or video. At CRM Asia Solutions we believe that websites are much more captivating by adding multimedia components. Zoho Sites allows you to easily add, again using drag and drop, multimedia such as presentations, flash, images, videos, maps and much more. If you have been involved with the building of a website you will know that it is not only the initial design development that is normally time consuming, but equally important, is the ability to easily and quickly update the content. Zoho Sites makes it very easy to update content on a regular basis even if it is only a block of text, an updated image, a complete new look and feel to your website, or dynamically update, in real time, a database powered by Zoho Creator, of, for example, your products, descriptions and prices. After you have developed your website with Zoho Sites, you simply review it for look, feel and content and go live from the Zoho Sites preview screen and publish it by clicking the button. It is that easy and quick with Zoho Sites. You can select from the Zoho Sites template gallery a suitable theme for your website, and, if you want, you can customise the template for your company's branding requirements, for example your brand identity of company logo, company images etc. And there is a template for you as the gallery is sectioned by vertical business types, so all you need to do is select the business category that matches your marketplace, choose the template theme for you and start to develop your website. All websites created using Zoho Sites CMS are also mobile compatible and you can easily preview your website during the creation stage to see what it will look like on a mobile device. No more dual website maintenance and expensive vendor/web development fees! 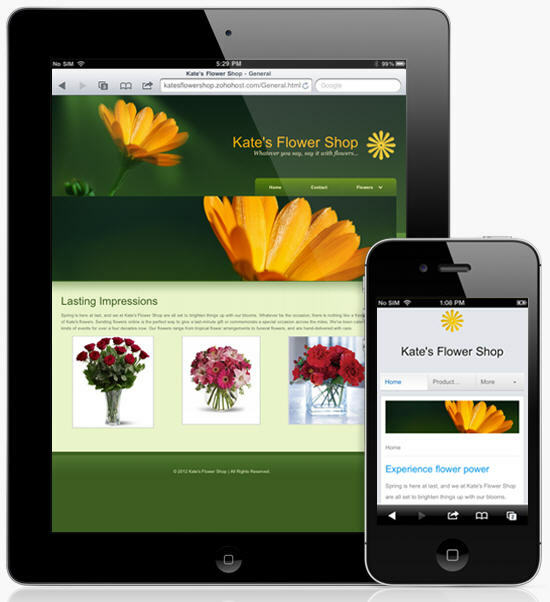 Manage both normal website and mobile website layout from a single location. In order to drive more traffic to your website, Zoho Sites comes with built in organic SEO features and you can optimize your entire website and individual webpages for specific keywords, website and webpage titles and website and webpage descriptions. As Zoho Sites is a member of the suite of online business tools from Zoho it is easy to integrate your website to Zoho CRM or even to a custom app you may have made using Zoho Creator. Both Zoho Sites Pro and Free editions include no ads, free web hosting, custom domain, unlimited pages, unlimited storage, traffic statistics powered by Google Analytics and SEO tools.